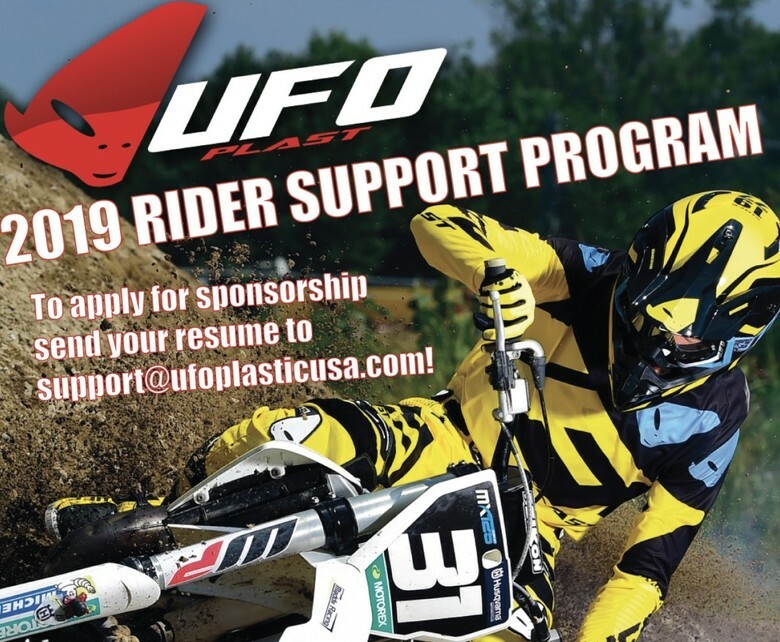 Submit Your Application for UFO Plastic USA's 2019 Rider Support Program Today! UFO USA, Jan. 3rd, 2019 – UFO Plastic USA’s Rider Support Program continues in 2019! The level-based support program provides sponsored riders with their own personal discount code to use when they order online at ufoplasticusa.com or over the phone at 815-756-9400. Special offers for pro riders and teams. Send your resumé to support@ufoplasticusa.com! UFO replacement plastic is made entirely in Italy with the best molds in the world! The plastics are stronger than stock and available in a variety of colors. We have restyled and custom plastics too! Join the 2019 Alien Invasion with UFO’s Rider Support Program! Approved Riders will then sign our Rider’s Agreement and receive their personal discount code. - Race results/ media exposure from the past year. - A short paragraph describing yourself and why you would be a good ambassador for UFO.